It’s been a couple of weeks of mild controversy in F1. Following their contentious collision in Baku, Lewis Hamilton and Sebastian Vettel have made up, whilst the FIA reviewed the incident and decided no further action was needed, a meek decision to some. Next up is Austria. The circuit here is a relatively short one – a simplistic-looking lap around the Red Bull Ring. Although the venue is the spiritual home of the Red Bull team, the nature of the track means they are unlikely to win here – the track is distinguished by various fast sections, with sector one featuring only one corner, and a DRS zone, whilst sectors two and three feature very few meaty corners, and several that can be hit at a reasonable speed. In short, Mercedes should go well here, and Ferrari, in theory, won’t be far behind – though FP1 threw up the possibility that Mercedes have edged ahead in the development of their car. Then again, there were signs of that in Baku, yet during the race Ferrari kept pace with Mercedes, so rule nothing out. Lewis Hamilton comes into this race 14 points behind his rival Vettel, hardly a big gap, but one he’ll want to start to closing. He could at the very least halve it (if he wins and Vettel is second, for example), but 2017 has offered up quite a few surprises already, so there can’t be any assumptions. So, what are the key features of the track? 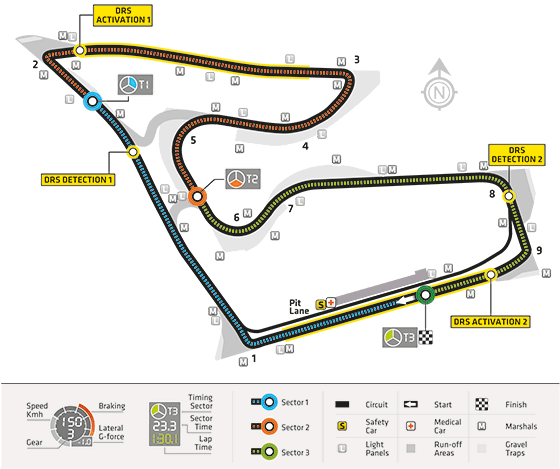 Expect overtaking moves into turn 1 (which is at the end of a DRS zone), or at the very least expect attempts into turn 2 and turn 3 (which is also at the end of a DRS zone). Beyond that, it will likely be hard to get close enough anywhere else, with the fast cars and fast corners making closing right in more or less impossible. The tyres on offer are the faster ones, so we might see one or two-stop strategies, depending on who wants to risk what. Hopefully, we shall have great entertainment come race day!